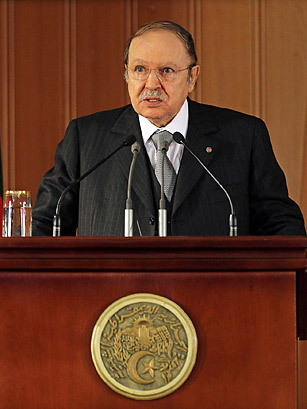 The 73-year-old Abdelaziz Bouteflika has been Algeria's President since 1999, a long-term operator within the ruling National Liberation Front  the party of socialist revolutionaries whose bloody independence struggle won Algeria its independence from France in 1962 but then rapidly transformed into a hegemonic one-party, army-backed regime. In the 1990s, the ruling regime fought a vicious war with Islamists, who had been denied their rightful place in the government after the army scrapped elections. During his tenure, Bouteflika has attempted to nurse relations with other parties and improve the country's poor record of democracy, but political freedoms remain checked while observers point to rampant corruption among the Algerian ruling class. Despite the country's natural-gas wealth, unemployment is high and a strikingly young population itches for greater opportunities. After a citizens' uprising ousted Tunisian President Zine el Abidine Ben Ali in January, Bouteflika, whose country is considerably poorer than neighboring Tunisia, looks set to face a budding popular revolt as well. Tunisia's rebellion was sparked when one marginalized youth set himself aflame. Seven such copycat self-immolations have taken place in Algeria since.